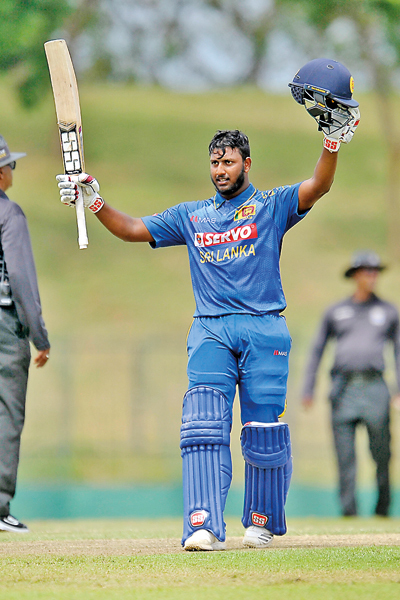 A splendid batting effort by the Sri Lanka ‘A’ top order helped them towards a crushing 60-run win over Ireland ‘A’ in the first of the five-match unofficial ODIs played at the Sooriyawewa International Cricket ground yesterday. All what Ireland ‘A’ managed was 305 runs after Avishka Fernando and Milinda Siriwardana stroke quick-fire centuries to help Sri Lanka ‘A’ post a mammoth 365 for 5 after they were put in to bat first on a placid batting track. The hosts got off to a flourishing start with openers Upul Tharanga and Avishka Fernando sharing 161 runs before Milinda Siriwardana stroked a swashbuckling century to lead Sri Lanka ‘A’ to a winning position. Tharanga departed after a well constructed 66 runs with five fours and two sixes but the 19-year-old Fernando and the veteran Siriwardana continued to torment the Irish bowlers in a brisk 75-ball, 91-run second innings stand. Young Fernando departed for 128 runs, hitting 11 boundaries and five sixes but by then he has set Sri Lanka into a imposing total. The experienced Siriwardana faced just 75 balls in his unbeaten 111 knock which included 11 boundaries and three sixes as Sri Lanka set a target of 366 to win. Jeevan Mendis remained unbeaten on 16 off just seven balls. Irish bowlers K.D. Chase (2 for 68) and S.R. Thompson (2 for 36) picked up two wickets apiece. In chasing Irish lost two wickets cheaply losing opener A. McCollum (11) and S.R. Thompson (4) but an impressive batting effort in the middle gave them a semblance of hope at one stage. James Shannon–the opener (67) and Lorcan Tucker (109) shared 99 runs for the third wicket while Tucker had a further 87 run stand with skipper Harry Tector (31) to fight their way back into the game. However, Sri Lanka hit back first by removing Tector and then Tucker who made 109 off 89 ball before Ishan Jayaratne trapped him leg before in the 36th over of the match. His innings had 13 boundaries and three sixes. S.C. Getkate made 37. Jayaratne was Sri Lanka’s top wicket-taker capturing 3 for 39 while Asitha Fernando (2 for 58) and Isuru Udana (2 for 44) shared four wickets to lead Sri Lanka go one up in the series. The second ODI will be played at the same ground on Monday. Is Hathurusingha worth the cash? Was Malinga the right choice? The Ceylonese Legend who captained three nations!